Emerging market economies grew at the slowest pace since September 2013, an HSBC survey said on Thursday. In February, the HSBC composite index, mapping both manufacturing and services, for India stood at 50.3, for China it was 49.8, Brazil 50.8 and Russia 50.2. The manufacturing and services sectors in India expanded faster than its BRICS peers in February. The HSBC Emerging Markets Index (EMI), a monthly indicator derived from PMI surveys, sank to 51.1 in February from 51.4 in January, signalling the weakest growth in global emerging market output since September. 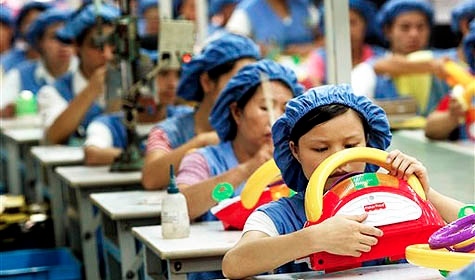 The moderation in growth reflected the weakest rise in manufacturing output in five months, HSBC said. Manufacturing output in emerging markets was weighed down by contractions in China, Russia and South Korea. Growth slowed in Mexico and remained weak in Brazil. “Emerging economies are struggling to gain traction. The HSBC EMI lost ground for the third straight month, slipping to 51.1 in February,” HSBC Chief Economist, CEE & Sub-Saharan Africa, Murat Ulgen said. HSBC said conditions are likely to remain subdued in March, with incoming new business rising at the slowest rate in five months. In February, employment was broadly unchanged over the month and backlogs of work declined further. The HSBC Emerging Markets Future Output Index, which tracks firms’ expectations for activity in 12 months’ time, picked up in February to an 11-month high, reflecting improved sentiment in both manufacturing and services. “Export orders still weak, hinting at Asia’s loss of competitiveness. The good news: firms are more optimistic about growth ahead,” HSBC Co-Head of Asian Economic Research Frederic Neumann said. Among the largest emerging markets, China posted the strongest sentiment in 11 months for manufacturing and services combined. Brazil posted the strongest overall output expectations, as it has eight times in the past nine months. Russia held the least positive expectations in February, followed by India, HSBC said.